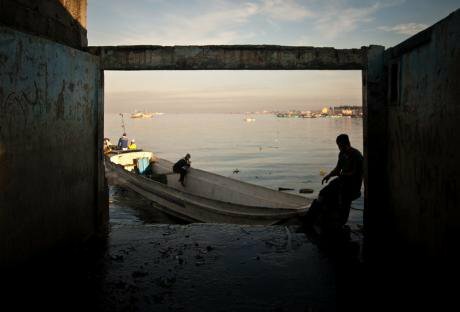 A Filipino fisherman rests at one of the fish markets near Manila. Ezra Acayan/Demotix. All rights reserved. 70 years ago, the sociologist Karl Polanyi wrote that ‘Enclosures have appropriately been called a revolution of the rich against the poor.’ Unfortunately as we marked World Food Day yesterday, this revolution of the rich is not over but rather seems to be accelerating. Much of the recent focus has been on the surge of land grabbing that has taken place since the global food crisis in 2007. But there is also another less known wave of grabbing which is taking place on two-thirds of this planet – our oceans. And like the global land grab, this ocean and river grab has an equally devastating impact for the well-being of millions of small-scale food producers, particularly fisher people and fishing communities. A recent report by the Transnational Institute, Masifundise and Afrika Kontakt on Ocean Grabbing shows how the rise of market-based fishing policies that favour large-scale aqua-industries is systematically dispossessing fishers of the means to livelihood. The report cites examples of luxury beach-resorts in Sri Lanka where fishermen can no longer get to the coast, the destruction of mangrove areas in Ecuador to promote export-oriented shrimp aquaculture that has destroyed fishing habitats, and the dramatic rise of Rights Based Fishery (RBF) policies that have handed over large tracts of ocean to industrial fishing companies in Europe, Canada and elsewhere. The common denominator in all of these cases is the exclusion of small-scale fishers from access to fisheries. In nearly every case, the grabs are technically ‘legal’, hidden inside policy documents, trade agreements, conservation mandates and fishing policies. What is left out of these documents is the impact of these decisions on our natural heritage and the livelihoods and food sovereignty of over half a billion people around the world who depend on small-scale fishing. The World Bank’s Global Partnership for Oceans (GPO) is one-such legal framework for ‘grabbing’. Bringing together a set of powerful actors – from USAID to the Walton Family Foundation (the family behind Walmart) to big environmental NGOs such as the World Wildlife Fund and the Environmental Defense Fund, GPO’s goal is to spread private property rights over the ocean’s fish resources. The experience of small scale fishers is that everywhere this model has been introduced – from South Africa to Iceland – it unleashes havoc in coastal communities. In South Africa in 2005, over 90% of the approximately 70,000 fishers nationwide were denied their right to access to fish-resources when government decided to parcel out fishing rights through a similar privatization program. The World Forum of Fisher Peoples General Assembly that met in South Africa in September 2014, a network representing over 10 million people from across the world (http://worldfishers.org/), made clear in their deliberations that neoliberal market policies and global inequity are the fundamental causes of ocean grabbing. The assembly issued a clarion call for an end to the privatisation of the oceans and proposed new fishing policies that put small-scale fishers at the heart of governing and caring for our oceans. Not only are these communities best placed to ensure food sovereignty, but they are also the starting point for any serious transition towards an ecologically and socially just food regime. This certainly entails a revolution, but this time one of the poor – one that seeks to end corporate enclosures and bring oceans back into the global commons. 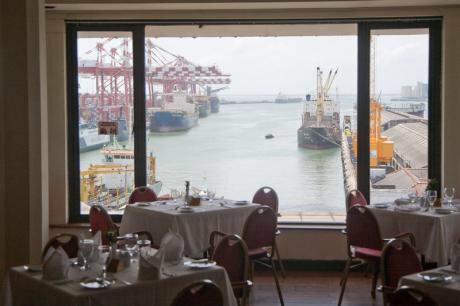 The exclusive view from the Harbour Room Restaurant in Colombo, Sri Lanka. Ingmar Zahorsky/Demotix. All rights reserved. Read the paper on which this piece is based.